There's a lot to say about bananas. They're a funny shape, and I'm pretty sure there are more songs about bananas than any other fruit. They're frequently involved in cartoon gags. The word bananas is a synonym for crazy. But you know what's really strange about them? 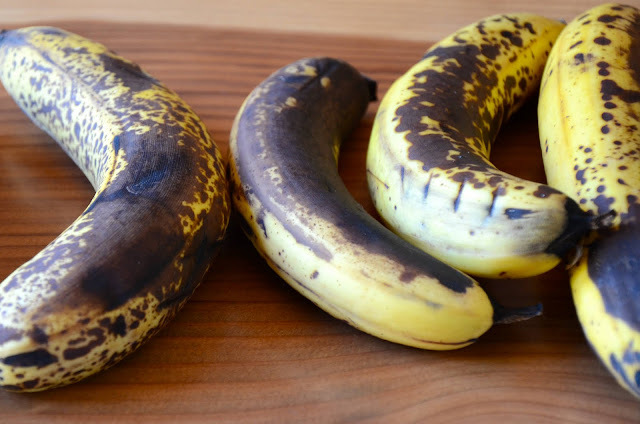 They are ubiquitous in the U.S.. You will see them at any supermarket, year round; if you stop at a convenience store that makes an effort to sell something healthy by having a couple of pieces of fruit by the counter, it's a pretty safe bet that a banana will be there (right next to a red apple). You'll find them at your continental breakfast at any roadside motel. But bananas are tropical fruits, native to the tropics of south and southeast Asia. The bananas we get from our supermarkets, convenience stores, and breakfast buffets are grown mostly in Central America and the Caribbean - some bananas are grown in Florida and Hawaii, but not nearly enough to satisfy our enormous appetite for bananas. When you take this into consideration, it's also strange that bananas are so cheap. Also, while we expect to see at least Granny Smith, Golden Delicious, Fuji apples in any old supermarket, bananas are always just "bananas." I hadn't thought about these things too much, actually, until I read the book Banana: The Fate of the Fruit that Changed the World, by Dan Koeppel. I learned all sorts of interesting things, like how United Fruit (now Chiquita) and Standard Fruit (now Dole) played an enormous role not only in popularizing the banana as part of the all-American breakfast (sliced over your corn flakes, of course), but were also pretty heavily involved in the economics and politics of the Caribbean and Central America. I also learned that wild bananas are full of large seeds and basically inedible, so the cultivated versions are seedless and propagated asexually - which means that they all have the same genetic material and are therefore extremely susceptible to disease. In fact, the variety that we buy today - the Cavendish - was a replacement for the universal cultivar of two generations ago, the Gros Michel, which was wiped out by Panama Disease in the 1950s. Well, I hope all that talk of shady fruit companies and banana republics and massive banana extinctions didn't put you off bananas, because we've got banana bread to talk about. 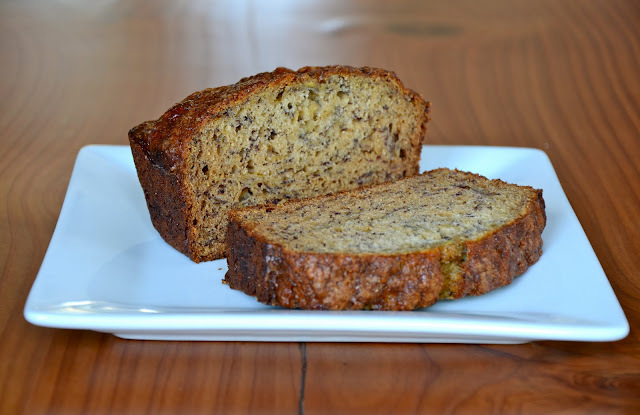 To be honest, I don't really like eating a plain old banana (I don't like the texture), but I love banana bread. We wanted to try America's Test Kitchen's version, which differs from your standard recipe in one major way: they have you microwave the bananas to remove some of their liquid, then cook that liquid down before adding it back into the bananas. 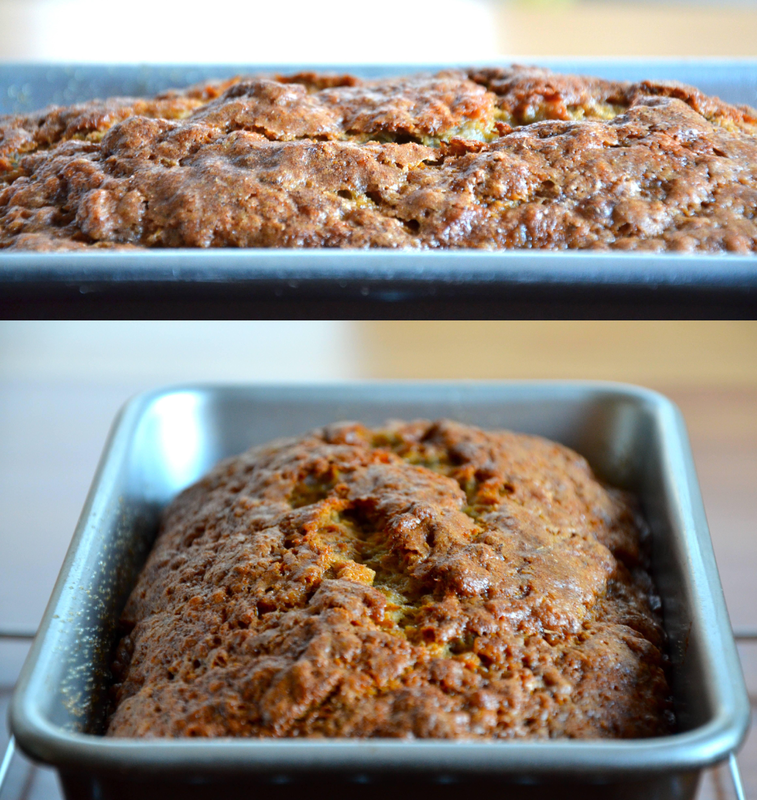 The end result is that the banana flavor is a little more concentrated, and the texture of the bread is less wet. 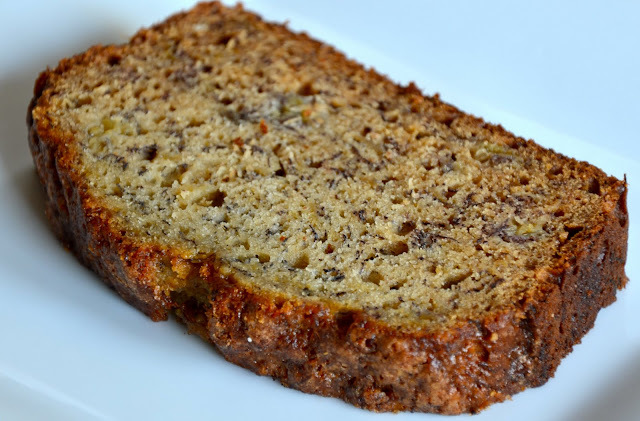 It is very good - but to be honest, banana bread is always very good, and we're not totally convinced that this version is so much better that it justifies the extra labor. On the other hand, it's really not that much extra labor, so why not try it and let us know what you think? 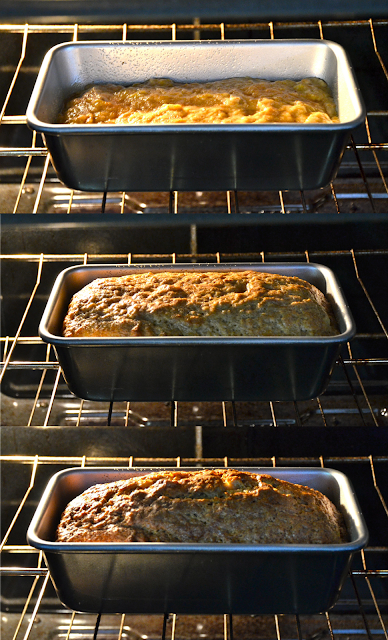 Preheat the oven to 350 degrees and spray an 8 and 1/2 inch by 4 and 1/2 inch loaf pan with nonstick spray. 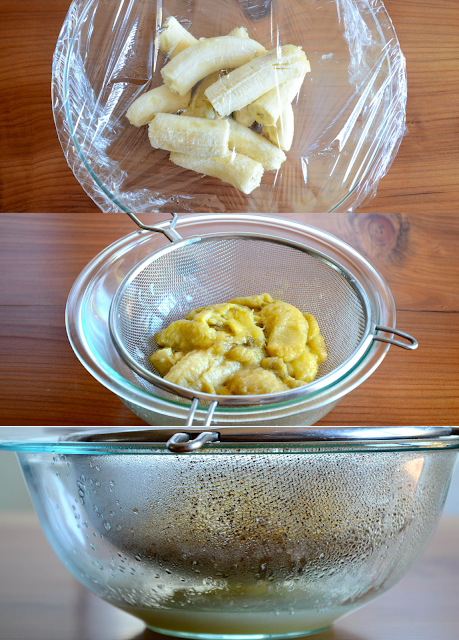 Put the bananas in a large, microwave safe bowl, and cover with plastic wrap. Cut a few slits in the plastic wrap for vents, and microwave on high for about five minutes (the bananas will become very soft and release some liquid). Put the bananas in a strainer over a medium bowl and let them drain, stirring a couple of times, for about 15 minutes, until you have about 1/2 cup of liquid in the bowl. Pour the liquid into a small saucepan and bring it to a boil, cooking until it has reduced to about 1/4 cup. Pour the reduced liquid back into the bowl with the bananas and use a potato masher or a fork to smash them until fairly smooth. Stir in the butter, eggs, brown sugar, and vanilla. Pour the banana mixture into the flour mixture and mix until just combined. Pour the batter into the prepared pan. Put in the oven and start baking. In a small bowl, combine the sugar and cinnamon. When the loaf has started to rise in the oven (after about 30 minutes), open the oven and sprinkle the cinnamon sugar on top. Continue baking for another 30 minutes, or until a tester/toothpick comes out clean after being inserted into the center of the loaf. When it's finished, let the banana bread cool for 15 minutes before removing it from the loaf pan to finish cooling on a wire rack.